Acute lymphocytic leukemia (ALL) is a fast-growing cancer of a type of white blood cells called lymphocytes. These cells are found in the bone marrow and other parts of the body. Acute lymphocytic leukemia (ALL) occurs when the the body produces a large number of immature white blood cells, called lymphocytes. The cancer cells quickly grow and replace normal cells in the bone marrow. Bone marrow is the soft tissue in the center of bones that helps form blood cells. ALL prevents healthy blood cells from being made. Life-threatening symptoms can occur. This type of leukemia usually affects children ages 3 - 7. It is the most common childhood acute leukemia. However, the cancer may also occur in adults. Note: These symptoms can occur with other conditions. Talk to your doctor about the meaning of your specific symptoms. Tests are also done to look for chromosome changes in the cells of some leukemias. Leukemias with certain types of chromosome changes have a poor outlook, while those with other types of genes can have a very good outlook. This may determine what kind of treatment you receive. The goal of treatment is to get the blood counts back to normal. If this occurs and the bone marrow looks healthy under the microscope, the cancer is said to be in remission. 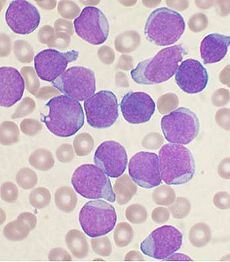 Chemotherapy is used to treat this type of leukemia. The first time you receive chemotherapy, you may need to stay in the hospital for several weeks. If you have a low white blood cell count, you may need to be placed in a hospital room by yourself so you do not catch an infection. You may also receive chemotherapy from time to time to prevent the cancer from coming back. If your leukemia returns or does not respond to other treatments, a bone marrow or stem cell transplant is usually recommended. A bone marrow or stem cell transplant may also be recommended if you have a brother or sister who is a complete match, or if you have a high-risk type of leukemia.